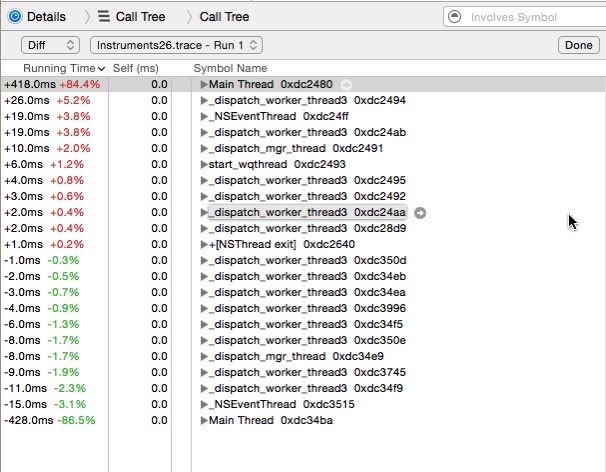 A new feature of Instruments in Xcode 7 is the ability to compare two call trees in the Time Profiler instrument. This article provides a brief introduction on using this feature. Comparing two call trees is also available in the Counters template (it was disabled for me in every other template), but I’m going to focus on the Time Profiler instrument since it’s the more commonly used instrument. I noticed the Compare Call Trees menu item was disabled for me in the Time Profiler instrument in Xcode 9.1 too. I don’t have an answer right now. If I find one, I will either update this article or write a new one specifically for Xcode 9. You should try asking this question on Apple’s paid developer forums. There’s a Performance Tools board in the Xcode section for questions about Instruments. An Apple engineer may have an answer for you.